Panel 47E, Row 007 of The Wall. 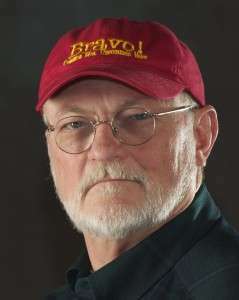 I’ve been having an ongoing e-mail conversation over the last several years with a Marine named Dave Evans who was in Marine Corps Training in the States with David A. Aldrich. Both of these Daves arrived together in Danang, South Vietnam in March of 1967 and one Dave went to Hill 55 with the First Battalion, 26th Marine Regiment. That was Dave Aldrich. I arrived on Hill 55 a day later. So Aldrich (that’s what we called him…we didn’t normally call anyone by first names in Vietnam) and I got to know each other fairly well, even though we were technically assigned to different platoons after our initial orientation while in the main battalion position on Hill 55. Aldrich, I believe, had an MOS of 0351 (the virtual wall states that he was an 0311) which meant he shot what we called “rockets” but which might be more simply understood as bazookas. I was an 0311, an infantryman, a grunt. I was assigned to Second Platoon and he went to Weapons Platoon, Bravo Company. Aldrich was a quiet guy with a big smile, as I recall, and a mellow sense of humor. 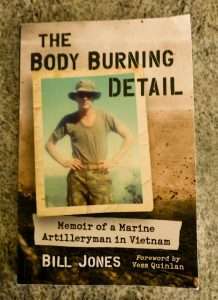 He stomped through mud and jungle grass with 1st and 3rd Platoons on patrol, too, but it seems like he was with us, 2nd Platoon, most of the time through the spring and summer of 1967 as the 26th Marines moved north from Hill 55 to the Khe Sanh Combat Base. He was with us through the monsoon season and up on Hill 881 South in the fall of the year. He was there, sharing chow with us, and jokes, playing cards, listening to the newest music on Corporal Mitchell’s portable record player…Sergeant Pepper’s Lonely Hearts Club Band and Aretha and Otis Redding and The Jefferson Airplane. Those days through the fall of ’67 were hard, wet and dreary and Aldrich was along all the time, shooting his rockets when necessary. Dealing with the wet rounds that failed to go off. That was tough for him, getting those dud rounds, those wet rounds, out of those tubes without them cooking off and blowing his arms and face off. I recall how cool he was about it. If he was sweating, he remained unflappable, only the barest hint of tension in the grit of his teeth. But even if he was scared (and of course he was) he certainly didn’t want it to show…we were Marines. When the siege began he came around my bunker a lot and stood watch with us and he and I talked about going home…home…like heaven. I remember one terrible day, February 25, 1968, our Third Platoon got ambushed and First Platoon went out to relieve them and they got ambushed, too. We, Second Platoon, were left to man the company’s lines. The NVA was pounding the trench line with sneaky 82 millimeter mortar, rockets and train-wreck 152 millimeter artillery, keeping us down, keeping us locked in the perimeter so we couldn’t go get our friends, our mates, who were dying out there within ear shot. It was one of the worst days of my life. My whole body shook. I imagined the red fire and searing teeth of death and conflagration. The end was here and I didn’t want to face it. I wanted my life. As this was going on, Aldrich came up and engaged me in conversation. He must have seen my shaking. I can only imagine how white my face must have been. How shrunken down into my utilities and flak jacket I must have been, as if that could have made any difference. But he didn’t act like he was seeing anything out of the ordinary. He soothed me with his words. He steadied me. He shook his head. We went back and forth, he resigned, me enraged, angry, and screaming. He wasn’t buying what I was saying. I didn’t accept the envelope. The next day was four or five hours of speeded-up, slowed-down hell. It was like Dante says in his poem, Inferno, “Abandon All Hope, Ye Who Enter Here.” I survived it and a lot of Marines didn’t. I remember walking down the red dirt road after we were ordered back into the perimeter. Men staggered along the lane. Some wore bandages on their heads, their arms and legs; some wore looks on their dirty faces that reminded me of dead people. Two men dragged a body down the middle of the road. I passed them and looked down. 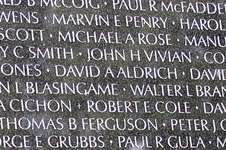 Even though his face was turned into the red clay, I knew it was David A. Aldrich, Corporal, USMC. I’ve been haunted by these images for over forty-five years. What could I have done to prevent Aldrich’s death? What could he have done? Did my failure to accept the envelope with the dog tags dishonor him? Maybe when I get done writing this, the images will stop coming. Later that day the word came down the trench line asking if anyone had seen Aldrich. He was missing in action, they said. I went up to the platoon Command Post and told them I had seen his corpse. “You’re sure?” they asked me. “Yeah,” I said. The platoon sergeant went up with me to Battalion headquarters and I signed affidavits of some sort saying I’d seen him dead. I signed the papers. He was dead. Killed in action. For years I’ve had a sneaking fear that somehow I was wrong, and David Aldrich is locked away in some prison cell in Hanoi. Seeing his name on the wall soothes that fear. Somewhat. Dave Evans asks that if anyone knew David Aldrich, please contact him at usmcdevans@yahoo.com. Today we learn reminiscences from former Bravo Company machine gunner Frank McCauley about an ammo dump explosion that occurred late in the siege, long after the notorious blow up of January 21, 1968. Residing in Khe Sanh was a very sobering and challenging place to hang your helmet. It was the only place and time in my life where there was no distinct color contrast. It was a colorless world, but for the red clay and dust that attached itself to everything and anything; you could not clear the red hue that was ever-present in the air. The lack of color was actually noticeable; very strange, not unlike, I’m sure, being on a lifeless planet. I think that contributed to the eerie feeling of being in Khe Sanh. The one thing you feared and expected to happen was a large, overpowering assault on our base. We were so far out in no- mans territory that help would have never arrived in time; we were outnumbered 7 to 1. I believe everyone felt vulnerable, isolated, and very much aware that the worst could happen at any moment. Yes, the tour bus had pulled out and you were left behind; so much for seeing the world. Not a very warm and fuzzy place to call home; it was not of this earth. Quiet moments were just pauses in the endless barrage of incoming rockets, artillery, and mortar rounds, and then of course, our artillery responding back. It would have been a nightmare, but you found yourself accepting all that insanity, because the alternative was death. Everything fell into a routine and no one expected anything less. But then there was this one morning, like no other morning. I’m not sure of the date; sometime in April, 1968, I think, because shortly thereafter, we pulled out of Khe Sanh for good. I woke to an unbearable silence that made me feel very much afraid, abandoned, and alone. It was a very peculiar, uncomfortable and frightening way to wake. I rolled over on my side and stared towards the opening of my small sandbag quarters waiting to hear or see something that would reassure me that I was not alone. My senses strained to pick up any kind of sound that would put me at ease, allow me some relief. It was the worst form of silence. My first thoughts were that we had been overrun during the night and I, for whatever reason, had not awakened during the battle. I assumed I was the last survivor; why else would there be such a deafening silence? Obviously, the enemy had overlooked me, in my dark little hole. I truly felt vulnerable, the only weapon I had was the M-60 machinegun that I hoped was still sitting in its place across from my quarters: in the bunker on the opposite side of the trench. What a bizarre feeling to slowly exit my hole-in-the wall bunker and find fellow Marines frantically scurrying around acting as if we were actually under attack. Yet, there was no sound, not even from their movements and haste. Finally someone stopped, grabbed me and said, “We all thought you were dead; no one had seen you all night during the attack.” Huh? What attack? I mean, yes my head felt stuffy, the sounds weren’t reaching me with any clarity or volume, it was much like you would experience if you were submerged under water. I was still baffled by what the guy had said. Why did they feel I must have been dead? I asked him what had happened during the night and he said in amazement, and with some doubt as to my question, that an incoming rocket round had made a direct hit on our base’s ammo dump, and that during the entire night, massive explosions went off from the immense amount of artillery rounds—mortars, grenades, claymores, bars of C-4, all the ordinance used by every weapon on our base—and then, along with all that, the 55-gallon drums of fuel were sent skyrocketing up into the air like fireworks. It had been a very long, loud, and horrifying night for the Marines standing watch at their designated positions waiting for the inevitable ground assault on our base. It will never be clearly understood as to why the enemy didn’t launch that attack. More than likely, it was just a lucky hit and they weren’t prepared to follow through. I was a bit confused; if all this had truly happened, then there was no way I would have slept through all that chaos, because my position was approximately 250 feet from the outer edges of the ammo dump. So being a bit curious and with some doubt, I pivoted and looked to my right down the trench line to where the ammo dump should have been, only to see the smoldering, rolled dirt edges of an enormous crater just 25 to 30 feet from my position. The trench ended there and the crater’s edges moved out from beyond our trenches towards our outer barbed wire perimeter fence. It all looked too surreal, this monstrous, smoldering crater within spitting distance of my machinegun bunker and residence. All the other outposts along the trench going towards the ammo dump and beyond were erased and were now just part of this amazing crater. This is why they believed me to be dead; it was assumed I had gone down to visit with one of the other posts during my watch and became just another casualty from that evening. It was then that it became a little clearer to me. I had not slept through this event, but had been knocked unconscious from the initial blast. Bummer; that would have been a night to remember. Ah, but there would be so many more nightmarish events to occupy your mind. In one’s tour of Viet Nam, there were so many times when you barely skirted death, that you accepted the inevitable, and just hoped to go quickly. Not exactly normal thoughts of an 18-year-old fresh out of high school, but the truth just the same. Frank McCauley was born on December 22, 1948, in Boston, Massachusetts. He was raised in San Diego, California, for most of his life. Later in life, he spent many years moving around the country: Texas, California again, Arkansas, and now back to Kerrville, Texas, where he has built his final resting place. Frank has been married to his wife, Linda, for 27 years. They have three very good sons, with two grandchildren from each of their marriages.